You're on a small island in the middle of a vast ocean. There's nothing but dirt, stone and grass on the your island, which is part of a tiny archipelago. One of the nearby islands features a dark cave, with what looks like a coal seam near the entrance. You can glimps two small trees on another island nearby. All around your little clutch of islands is what appears to be vast, unending ocean in all directions. It's midday and you need to make yourself safe for the night. You can use the wood from the trees to craft a pickaxe. With this, you can fetch some coal from the seam. With the coal, you can create some torches, to see in the dark. You might have enough wood left over to make a door, if you're lucky. Or perhaps you should save it to craft a boat, or a sword. Groans from something unknown emanate worryingly closely from the darkness of the cave. You're lucky: one of your two trees has dropped a sapling. You eagerly plant it. In a few days time, you might be able to harvest some more wood. You've been granted a temporary reprieve, but the law of diminishing returns means at some point, and soon, you'll run out of wood. Swimming is time-consuming. By the time you have assembled a meagre supply of wood and coal, it's almost sunset. You nervously dig a burrow in the mud of your original island, light it with a torch and block the entrance back up. Night passes slowly as you listen to things crawling around in the darkness outside. 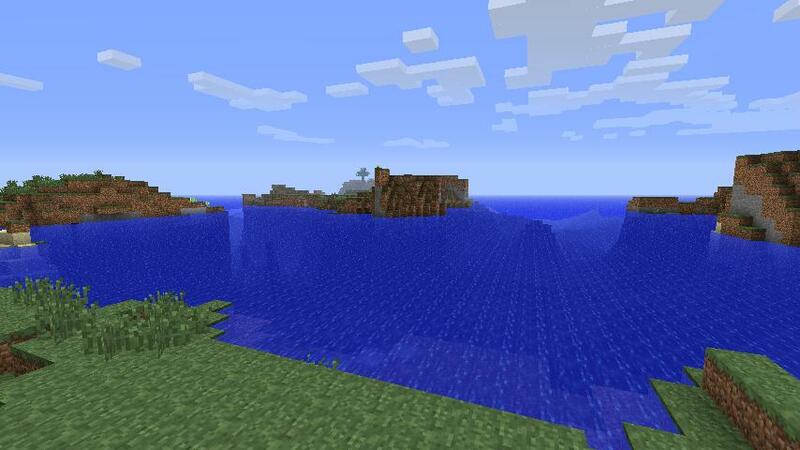 I first learned about Minecraft from this blog post by Mike Watson last year. Mike did a great job of demonstrating the narrative power of the game and his post left a lasting impression on me. Every now and then I dip in to Minecraft to see what's new since the last time I played it. In the last few months version 1.8 was released and so I started a new map to check it out. I ended up with a corker of a randomly-generated map. Inspired by Mike's post, I thought I'd write a bit about it. In a follow-up post I will provide the map itself.